Firefox is perhaps the best browser available on internet .I have been using Firefox for few years from now and I am totally impressed with its browsing capabilities and features like profiles ,addons, themes, etc .Firefox has became one of the favorite browser of webmasters and people interested in computers and internet .But what about the normal non tech-savvy internet users ?? Yea! they still prefer Internet explorer . 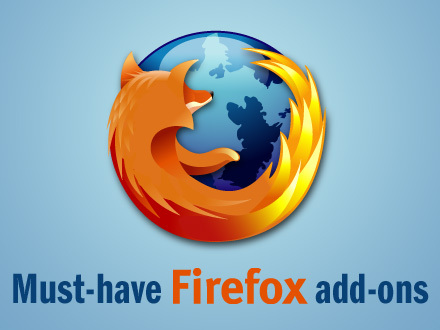 So by this post I aim at bringing your attention to 25 most useful Firefox addons that makes you to re-think while choosing your default desktop browser . Firefox addon Fasterfox can tweak the internal Firefox settings to bring out maximum performance and speed . Though I felt major changes in my broadband connection speeds , dial up speed remained unaltered . Ultimate Firefox addon for Twitter lovers . Twittfox places a small icon near Firefox’ bottom tab that gives instant notifications when your friends update their status .It also has a text field to update your status .So ultimately , you don’t need to login Twitter to post and receive tweets . It is essential for a webmaster to check the details of his own/friends/competitor websites for various factors like PageRank , Compete rank , Alexa rank , nofollow , Whois , backlinks etc . This addons accommodates itself into any desired location of Firefox and produce details automatically as we move through each website . Previews links and images on mouse over ,without leaving any website or blog . Orkut addon toolbar could be used o beautify Orkut scraps , Profiles and community messages with special characters ,smileys etc . It also helps the users to insert animated flash movies and images on Orkut scraps . Dofollow blog/forum commenting is an essential seo strategy .Nodofollow Firefox addon checks the page for nofollow and dofollow links and applies suitable colors to differentiate them. Amazingmedia browser extracts the direct links to embedded flash , movies ,music etc. from websites so that we can download them directly . Colozilla is color picker tool . Its quiet useful for choosing colors for advertisement headers or web design . Color picker can be dropped anywhere on a website to get the exact hex values of color code that could be used with CSS designs . Newsfox is one of the best Firefox RSS feed aggregation tool . It has three panes . We an add , manage and select feed sources on the left pane . Right pane list all recent posts and bottom pane previews the selected stories .It has an automatic feed refresh feature that let us know when there is an updated feed . Foxytunes Integrates popular media players into Firefox browser so that we can manage and play them right from the browser interface itself .Also the addon helps us to find more details about the media , from various internet portals and services . Very useful addons for Bloggers . Dictionary automatically checks for misspelled words and provides corrections on right click . Next time you don’t need to save the whole web page as folder in your computer . Use PrintPDF Firefox addon to save your favorite web pages as PDF files . Web designers can use this addon to check how their design works on Internet Explorer , without leaving Firefox . Reduce the length of long URLs in single click , to be used in blogs , forums, Twitter or for email . IRC(Internet Relay Chat ) client for Firefox . Zemanta is yet another useful Firefox addon for Bloggers . It analyzes typed blog content in our text editor and produce related suggestions ,tags ,images, posts by connecting to their servers . Adblock Plus Blocks annoying images and banner ads from internet . You can customize this addon by adding adding filters or websites to black list or white list . Highly useful addon for Bloggers for capturing an entire web page as PNG image files . Shareaholic enables you to quickly, and very easily share, bookmark, and e-mail web pages via your favorite web 2.0 social networking & bookmarking sites like Digg, Facebook, Reddit, Mixx, Twitter ,StumbleUpon, and many others. This is must have addon for every Blogger who likes sharing and socializing . Helps to manage multiple Gmail inboxes from Firefox interface .Also gives detailed information on number and details of mails on Draft , spam and inbox folders. Firefox Addon that Notifies when their is a new mail in your Gmail ,Yahoo , Live and other supported email clients . Reliable download manger that integrates with Firefox to speed up downloads to a maximum of 400% than normal value . Search and download torrent files from Firefox interface itself . And finally what you would if you want to backup your addons and themesfor future use . Here is another Firefox addon that can combine allfirefox addons to a single xpi file . Presently I use more than 20 Firefox addons and here Ihave provided a random list of my favorites . So if you have otherrecommendations to this list , you can contribute here . Nice collection of fire fox add ons.Thanks for sharing.